We reported back in February about a bill to legalize lane splitting in Oregon, SB 541, introduced by State Senator Larry George. Although referred to the Oregon State Senate Transportation Committee, the bill has since apparently languished – there has not been a hearing. We’ve asked George’s office for an update, but haven’t received any response. There’s a parallel bill in the Oregon House of Representatives, HB 3310, introduced by Representatives Tim Freeman (a motorcyclist, according to his bio) and Brian Clem. HB 3310 and SB 541 are similar bills in that both would amend ORS 814.240 to allow lane splitting in specific circumstances. The bills differ in the speed at which splitting would be allowed: SB 541 would allow splitting at no more than 20 MPH if traffic is moving at 10 MPH or less, while HB 3310 would only allow splitting (speed not currently specified) if traffic is stopped. Yes, HB 3310 is more restrictive. Both of these bills have been sitting in “referred to committee” status for a while now. Word on the streets of the internet is that SB 541 is not going to be heard, but we haven’t been able to confirm this. We’ll keep trying to track down more information on both of these bills, so stay tuned for updates. ‹ Nevada Lane Splitting Bill AB236 Passes Assembly! Thanks for the updates. I was originally a California rider, and now that I’m living in Oregon, I get frustrated when I am impeded by a mere law when the conditions for splitting are favorable: stopped/slow traffic, good weather, wide lanes, straight road, good visibility, narrow bike. 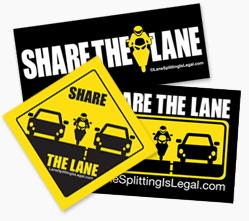 I’d like to know how to support this and other bills to get a favorable vote in allowing lane splitting. Thanks for your comment, Isaac. In the coming downtime between new bills and the next legislative session in most states, we’re working on some resources that riders can use to help push lawmakers on this issue. Stay tuned! Isaac, what is your hurry that you need to lane split? If you need to lane split, you should have left earlier.